Article 8 : At the start, each rider will receive a brevet card and a cue sheet indicating the route and the location of the checkpoints. Riders must stay on the route. If a rider leaves the route, they must return to the route at the same point prior to continuing, ie. no shortcuts or detours from the route, unless specified by the organizer. 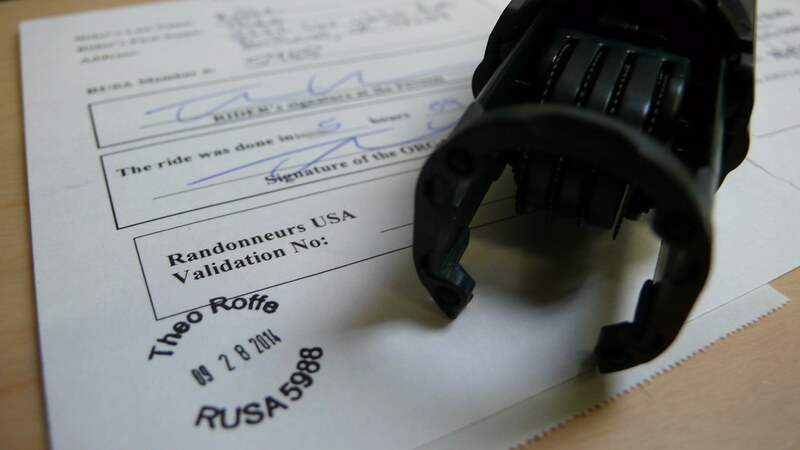 Riders must stop at each checkpoint to have their card stamped. Organizers may also include unannounced checkpoints along the route. This assures that everyone will stay on the prescribed route. And so I got a stamp! It is a Trodat Printy 46119 with my name, RUSA number, and the date. I had hoped to have it in time for the Volcanic Arc 1000K, but it just arrived today. Looking forward to using it at a staffed control some time soon. I also inherited a 100KM permanent route (#2337 Running of the Bulls) which I rode for the first time this Sunday. Sending my card and proofs of passage to The Permanista. 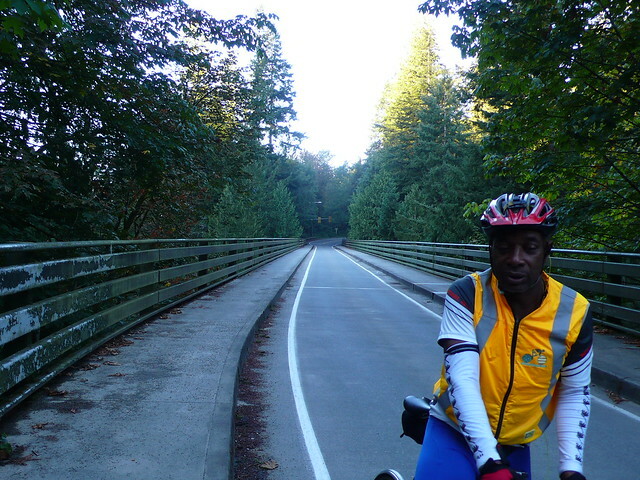 On September 5th, at 05:00, Vinny Muoneke and I set out on the Volcanic Arc 1000K, a one way ride from Federal Way, WA to Eugene, OR. We committed to the distance and the date for this event in October of 2013 at the SIR annual meeting. Our idea was to do a mountainous ride. 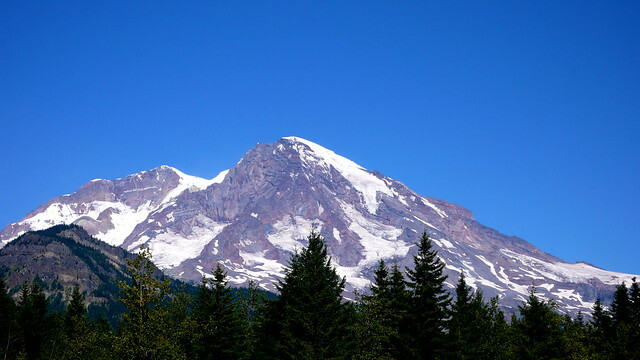 Let’s do a ride in the Cascades from the Seattle Area and head south to Eugene, where we can hang our bikes on a hook and ride the Amtrak Cascades train home. Do your best to ride a quick and efficient first day because it will pay off later. 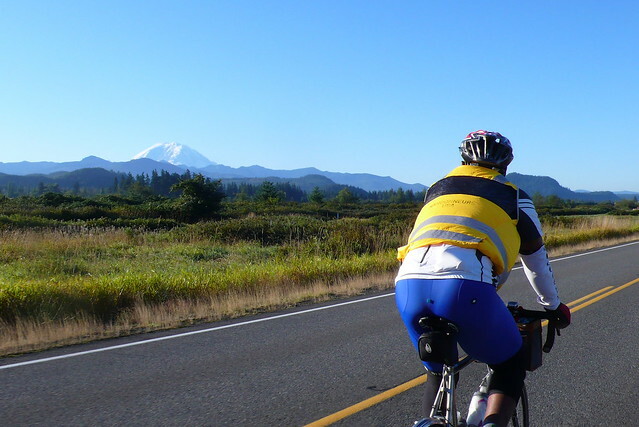 But do keep in mind that the kilometers you pedal in Federal Way and Auburn will not be fast. Early morning commuters are on a mission and may pass a bit too close, a bit too fast. So be as alert as possible for 5am Friday. And you’re likely to catch red lights. Many of them. We caught every light in Auburn. If you need something, there are services here. Leaving suburbia, we entered lightly foggy rural Western Washington. Car traffic died down, except for the occasional pickup and a school bus that passed us at least twice (We passed the driver stopped for a smoke break! Don’t worry, there weren’t any kids on the bus). Sleepy cows didn’t bother getting up when we passed, they just laid in the tall, wet grass as we shivered by. Approaching Black Diamond, the road begins to roll and then climb in earnest. The store in Cumberland was open and they told Vinny that they open at 6am, but past rides have shown him that they don’t always keep these hours. So this may or may not be a useful location for a re-supply, but the control in Enumclaw is only another 17km down the road. 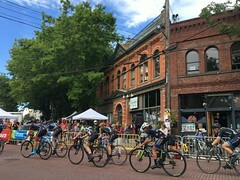 Speaking of Enumclaw, the route follows the same cues here as the Cascade 1200K with a left from WA 410 onto Park Ave and a right on River Road. But on a Friday morning, that turn isn’t easy and might not be safe. You might prefer what I’ve heard alternative transportation wonks call a “Copenhagen Left” — when you reach Park Ave, cross the intersection and pull to the side of the road; now turn your bike 90deg to the left; when the light changes, cross WA 410 and you’re good. Leaving Enumclaw, you’ll take the Foothills Trail which is pleasant and direct. The only real challenge is recognizing your correct exit as there aren’t any way finding signs on the trail! I’d suggest looking at the map before riding, especially if you’re traveling from out of town and haven’t been on this trail before. 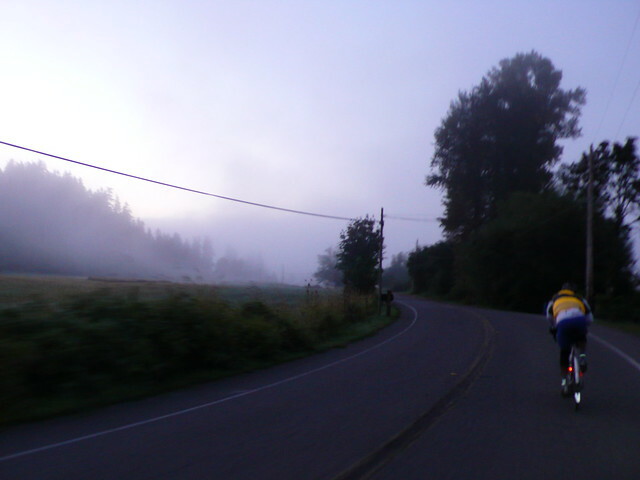 After the trail, it’s some pleasant highway miles into Eatonville. We recommend the Plaza Market for a quick resupply, but the cafe is quite good and there are a few other options, including a Subway which has not demonstrated itself to be a quick control choice. The cafe can be slow, too, so check it out before committing. A Classic Car and Porsche-enthusiast group had passed us on Orville Road approaching Eatonville. I’m not big into cars, so I can’t get too specific, but I saw several newer Porsches, a beautiful vintage Porsche, a Ferrari (red, of course), an older Mustang, an early model Ford, and a couple of zippy things that I didn’t recognize at all. They all stopped at the cafe… Oh, you’re the bicyclists! Oh, you’re the classic car group! Slightly longer line, but they got there ahead of us, so had mostly ordered already. The croissant breakfast sandwich was good and I was happy for a cup of hot coffee. 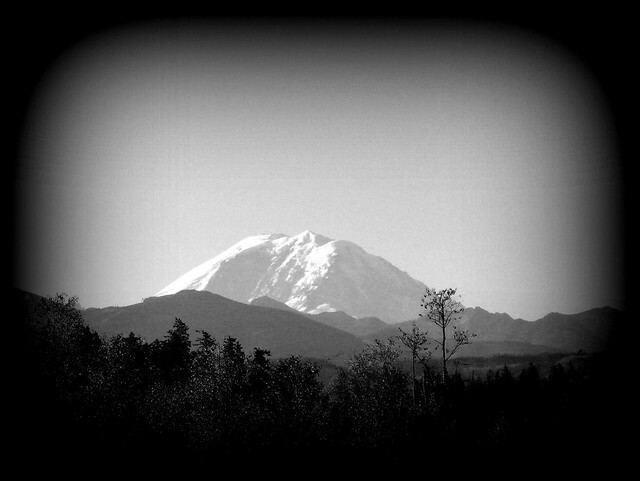 WA 7 takes you South of Mt Ranier, for some lovely views of the mountain. There are several little stores and restaurants along this road in Ashford, so be sure to resupply as necessary. I flatted here and Vinny almost lost his pump, but we circled back for it. Along the way, I noticed that the Highlander Restaurant had free wi-fi. There wasn’t any ATT cell service, so if you need to make contact or get your Facebook fix, you might check that place out. After Ashford, you’ll turn onto Skate Creek Road, arguably the first real climb of the route. 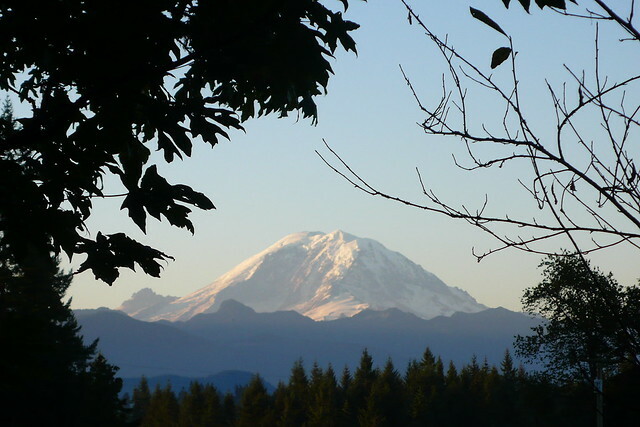 It peaks at ‘only’ 769m (2524ft), but is nicely graded and affords nice views of Ranier, the Nisqually River, and Skate Creek. The descent is quite nice and a Strava segment, if you go in for that kind of thing. 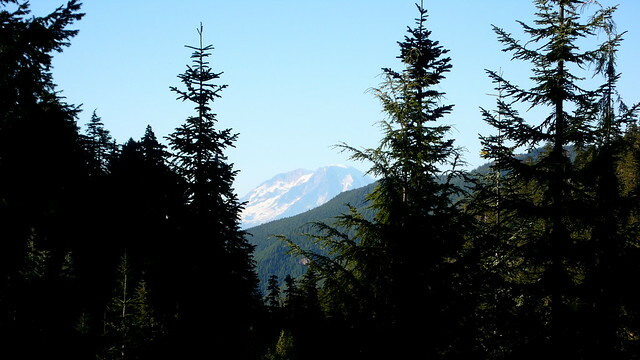 We strongly suggest resupplying in Packwood or Randle, before tackling the upcoming two mountain passes. From Randle, you will take NF-25 over Elk Pass. The SIR Summer 600K (Chili Feed with Bumps) took NF-26, which Vinny calls 25’s “evil twin.” You’re welcome to go that way instead, but I’ll question your sanity. At the bottom of the descent from Elk Pass (1217m/3992ft at the first summit – don’t be surprised by the second, slightly lower summit! ), turn left onto NF-90 and cross a bridge. Just past the bridge, on your left, is the Northwoods, WA Eagles Cliff Store which is open until around 8pm most nights. We talked to the owner who vividly remembered the Cascade 1200K riders and considers Randonneurs crazy, but good customers. She told us she’ll keep the store open until 8pm the Friday night of the ride, so you should be able to resupply before Old Man Pass (aka Curly Creek Road) which summits at 2984ft (910m) rather quickly – it’s a steep and winding climb. The descent takes you into Stevenson and the first of the ‘overnight’ controls. This control closes at 04:24 on 9/20, but I’d suggest you leave no later than 04:00. I set 3 alarms to that effect, but slept through them and didn’t get us up until 3:35. From there, we went West, off-route, to visit the nearby convenience store. 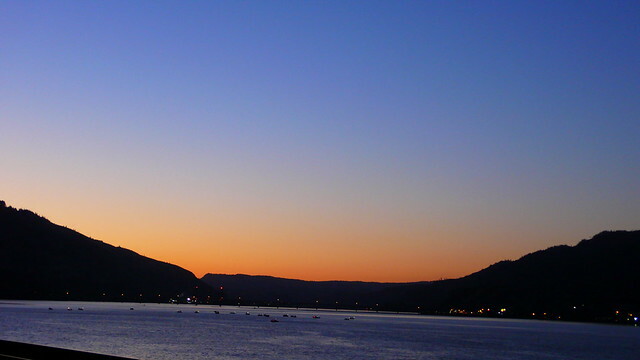 If you can snack from your handlebar bag, you can wait for the convenience store at the Hood River Toll bridge, or Bingen, about 20 miles into the day. 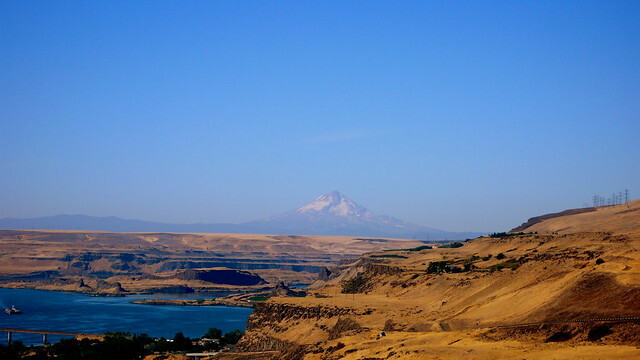 Highway 14 is a pretty road along the Columbia with good views of Oregon. 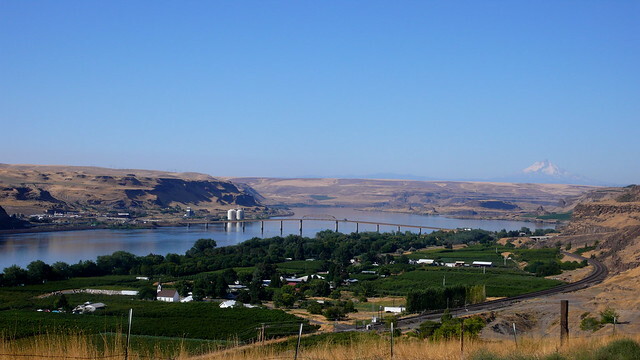 It does climb a few times and you may feel jealous of flat I-84 on the Oregon side of the river, but the lower traffic and cleaner shoulder of 14 is a good trade. The road has been freshly chipsealed, so you’ll be happier with wider tires. I rode 38mm tires and Vinny rode 32mm. I was 18.75% happier than Vinny! The other thing to know about Highway 14 is that it’s a fishing road. You’ll get passed by several pickups with boats on trailers. They all gave us room, but it’s something to be aware of. I enjoyed seeing all of the boats out on the river and on Trout Lake (to the left of the road, before White Salmon) and didn’t mind the passing terribly much. There are 5 tunnels along 14, so hit the button for bikes and alert those anglers that you’re in the tunnel. Your lights will probably already be on since you left before 04:00 (right? ), but turn then on if not. 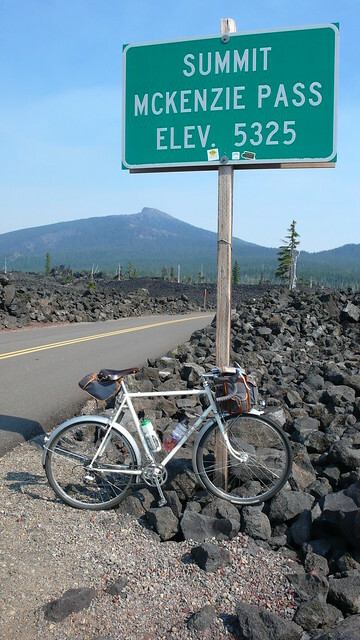 In Biggs Junction, OR, refill your water bottles and then climb the Fulton Canyon road. 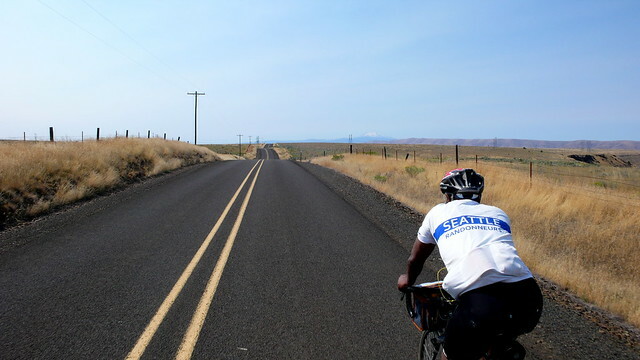 This will be the first of many (seemingly endless) climbs in Eastern Oregon. But hopefully you’ll reach it before the day is truly hot. We hit it a little later than is ideal and were well aware of the lack of shade. 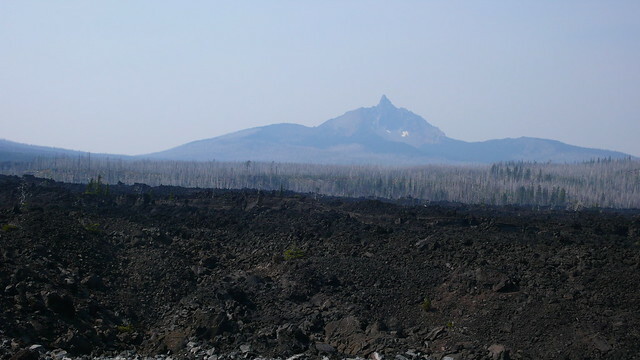 The lack of shade will continue until… Old McKenzie Pass on day 3. For this reason, be sure to take some time to cool down and rehydrate in Moro, Tygh Valley, and Maupin. In Moro, there’s a little park with restrooms and shade – a great place to cool off before climbing up to the plateau where you’ll be around 609m (2000ft) for 48k (30mi). The descent to Sherar’s bridge is winding and fast and lovely. It also got hotter as it went down to the river. 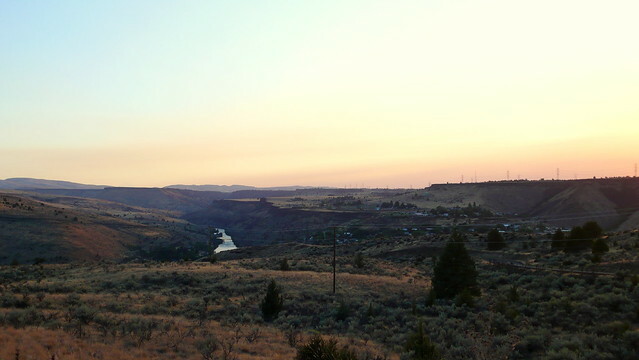 The bridge crosses the Deschutes in the Warm Springs reservation where there are still platforms in the river for traditional dipnet fishing, which used to be practiced all over the Columbia before the dams, most notably at the beautiful, lost Celilo Falls. The climb up to Tygh Valley isn’t long or steep, but it is hot. Hot enough that it really hurt Vinny. This is where being a smart rando is more important than being a strong rando! Vinny decided that he needed to stop for a long time at the Tygh Valley Store, losing much of the time we’d gained, to lower his core temperature and try to rehydrate. He was careful to drink not just water but to replenish electrolytes. Once his stomach settled (the heat can make you feel nauseated), he tried to eat some gentle foods. Meanwhile, less affected by the 90F+ temperatures and total exposure, I ate voraciously and waited patiently. When we arrived, I thought the ladies at the store were going to call paramedics for Vinny, he was so wrecked, but by the time we left he was practically flirting with them and, once again, looked great. So we hit the next big climb and then recovered again (less intensely) in Maupin. Fun side note: We were on some of the same roads through this area as the Ring of Fire endurance race, but going in opposite directions. 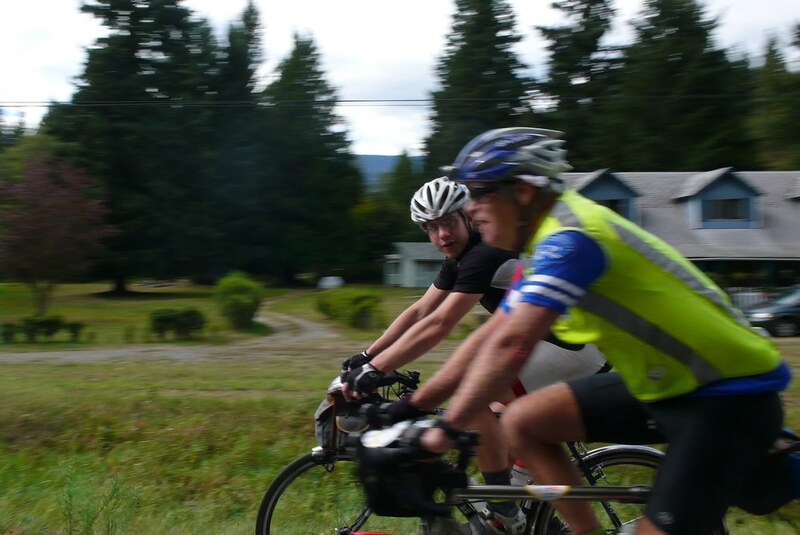 We got to see fellow SIR riders Mick Walsh and Jan Acuff on their 12-hour solo races! A pleasant surprise. Randos sure do get around. After Maupin is the threateningly-named Bakeoven Road. It looks like a steep climb with several switcbacks up a golden brown hill. And it is, but somehow, over the next 18 miles, it goes up to over 1067m (3500ft). I have no idea where that elevation comes from. It is a mountainous mole hill. There is no peak, just constant elevation gain until Saniko. When we got to Shaniko, nothing was open. Several signs proclaimed “No Gas In Shaniko!”. Fortunately, there’s a hose bib on the park side of Goldie’s Ice Cream Shop, so if you get in as late as we did, you can still get some water. To be polite, we reattached the hose after filling our bottles. It’s also an info control, so don’t just breeze through the town and down the steep hill to Antelope. 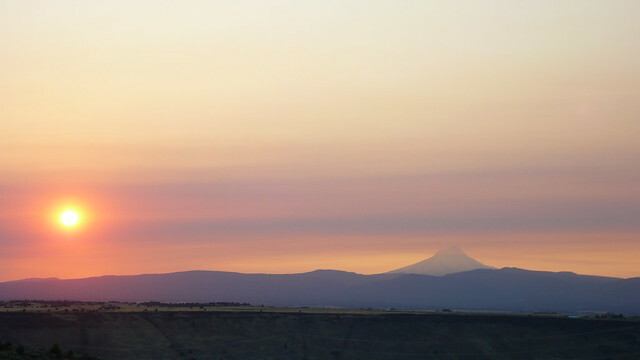 Antelope, population 46, was briefly named Rajneesh and, while it’s a tiny spot without much to see, is an interesting location in Oregon history. We took a caffeine ditch nap here and put on headphones (only one ear for me). The next 22k (13.7mi) are maybe my favorite of the entire route. The road trends downhill sufficiently to keep your speed high (much like a tailwind), but it also twists and is punctuated with little climbs. It was exhilarating to ride and the enormous moon (one night before full) lit up the surrounding hillsides with a gentle glow. I covered my headlight briefly with my hand and could see the road pretty well, but the light was better and made me more visible, so I uncovered it again. When that lovely stretch of road ended, we turned onto Hwy 97 and spent the rest of the night in the fairly wide and clean shoulder. The road here gains 400m () somewhat gradually, punctuated with big hills. Unfortunately, the hills are too far apart to maintain any momentum from the descents to help with the next climb. You just have to work your way along to Redmond. On the plus side, there’s a 24-hour convenience store in Madras with a very friendly staff (Ahern’s). They were suitably impressed with out (crazy) endeavor and didn’t seem to mind our hanging around in funny clothes – though they didn’t want us sleeping on the floor. 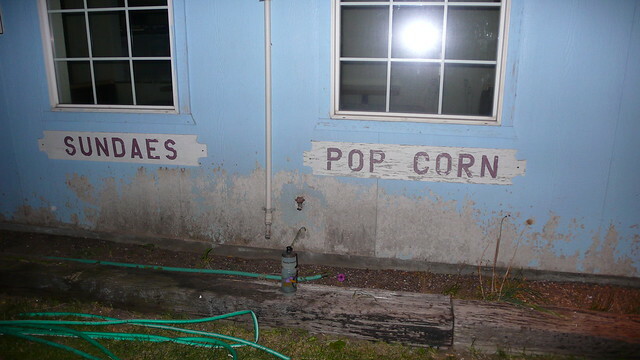 At least they have a microwave and a bathroom. And coffee! Traffic started to pick up on 97 as we got into Redmond and the last few miles to the overnight hotel (or early morning hotel, if you’re like us) were somewhat unpleasant as a result. The shower and a few hours of sleep made up for it entirely. Vinny had mailed a box ahead with clean bib shorts and a fresh jersey, which I carried from the hotel office for him. Strangely, when we reached our room, he was also carrying a box. We were tired, so it took us a few minutes. We woke before our alarm, about two hours after the control close – a decision we don’t regret as we easily made up the time with the slower minimum speed after 600K. There’s a Shari’s just down the highway (same direction as the route), but we turned off onto the more pleasant Canal St (b/c Old Bend Redmond Highway) and decided to eat breakfast in Tummalo at the info control. 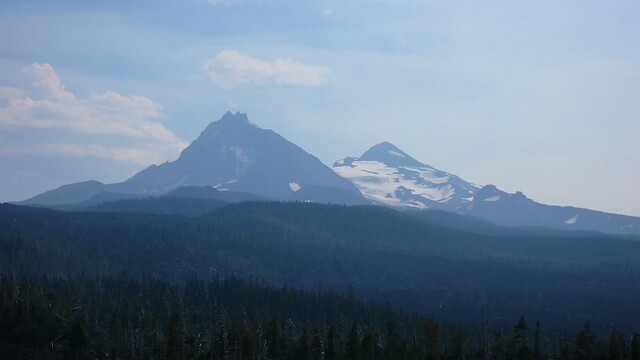 This was a pleasant, low traffic street that lost elevation and featured great views of several peaks: the Three Sisters, Little Brother, The Husband, Mt Washington, and Black Butte. I ate a giant apple fritter and drank some sports drink at the gas station in Tummalo, though I was a bit jealous of the local cyclists sitting outside the cafe – that looked a lot more relaxed and I could have gone for a nice cup of coffee. From Tummalo, the route turns onto Hwy 20 which has a narrow shoulder and a bit more traffic, but wasn’t bad. Vinny flatted just before a scenic viewpoint, so we swapped out his tube and tire under the watchful eyes of the Three Sisters (and a motorcycle tourist from Seattle). In Sisters, we took lunch at Bronco Bill’s which was OK. Vinny was still having trouble getting much food down and trying hard to bring his electrolytes back into balance. After a longer stop here than I would have expected, we got back on the road approaching Old McKenzie Pass and the highest elevation of the route. 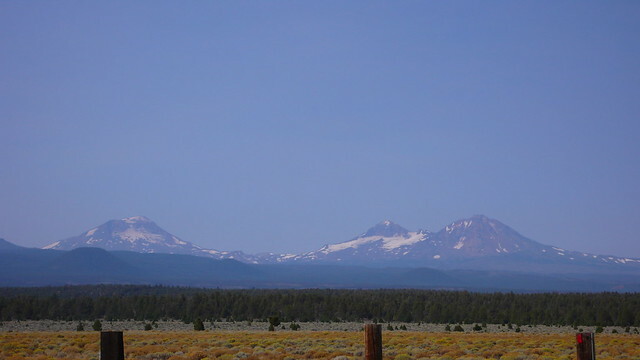 The temperature was in the 80s(F) at least, but not so bad as Eastern Oregon. The road is lined with beautiful Ponderosa pine, which are spaces far enough apart to let a lot of sunlight down to the ground, but provide at least some shade. Up to the Sea of Lava, that is. Approaching the summit, I was amazed to see what looked like the biggest dumptruck in the galaxy had simply dropped a load of rock everywhere. 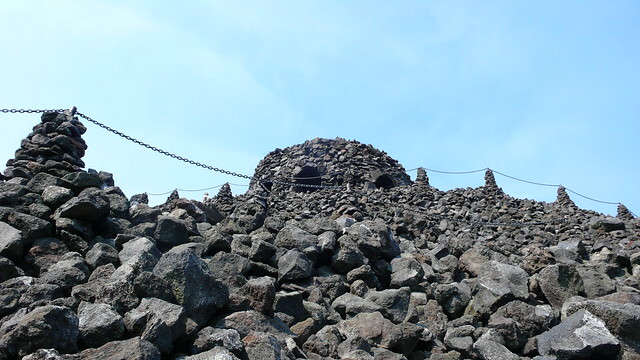 As far as you can see, it’s just a big pile of rocks circles by volcanic peaks. I wish John Pearch has been on the pre-ride because it would have been great to have a geologist on hand here. 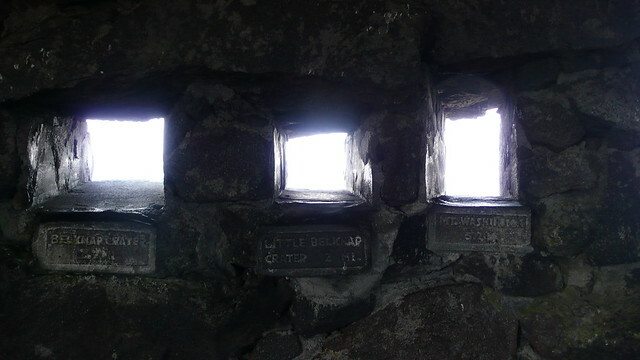 At the summit, 1,623 m (5,325 feet), the Civilian Conservation Corps built an observation post out of the most readily available material – lava rocks. 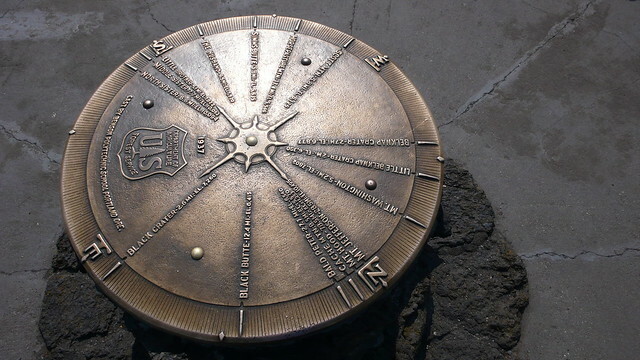 It has little windows framing each of the surrounding peaks for easy identification and, on the upper observation platform, a giant brass compass built at Portland’s Benson Polytechnic High School indicates directions and locations of each peak, as well as the height of the summits. Waiting for Vinny at the top, I chatted with a local rider who I’d passed on the climb. 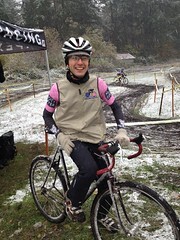 He takes his Cervelo by car to McKenzie Bridge, rides to sisters for lunch, picks up a pound of coffee, and rides back. Seems like a great day ride. Vinny caught up and led us down the descent – and what a decent! 55km (34mi) of downhill, much of it winding, well shaded by dense tree cover, and with corners that allow for minimal braking. There were some tight turns and I did slow down, but an experienced and confident descender could really make up some time here. 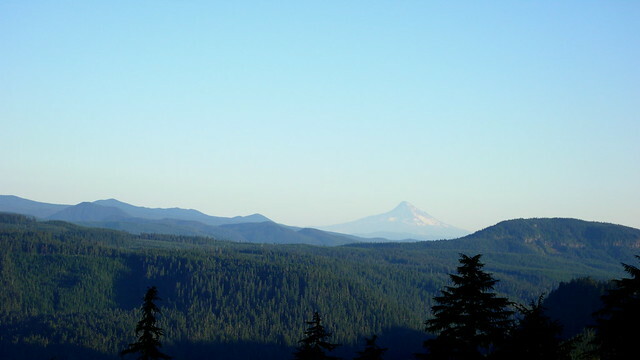 At the bottom, you’ll turn onto highway 126, which parallels the McKenzie and Blue Rivers. There are several places to resupply, from convenience stores to restaurants. If you pass Takoda’s Restaurant without stopping anywhere for food or water, you’ve gone too far! Go back, and get something. If you don’t need it now, you’ll be thankful for it later because, unless you’re wicked fast, everything between here and Eugene is going to be closed. That’s 193k (120mi), including a climb to 1142m (3747ft), without services. We didn’t fill out bags with extra food and, riding through the sleepy town of Oakridge, we were hungry and sad to see every business closed. Learn from our mistake, don’t make it for yourself. Turning off 126, you’ll be on NF19, aka Aufderheide Dr, which would probably be a lot more fun in the opposite direction. 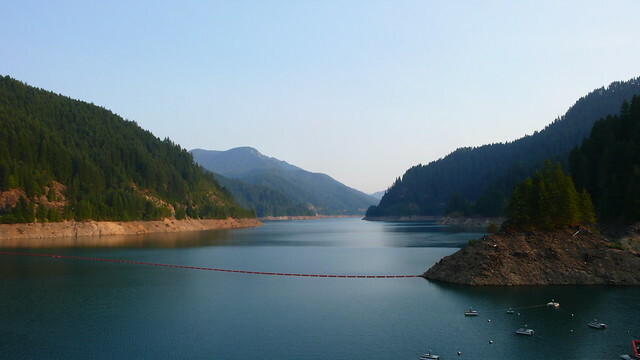 The climb is steep at first, mellowing at the Cougar Resevoir, but goes up in stages, including a rather steep stretch near the top. At the summit, 1142m (3747ft), I pulled on some layers, put my rear light on blink, placed it on the shoulder facing downhill, and pulled myself and my bike off the road for a ditch nap. I don’t know how long I was out before Vinny came by. He told me there was no way he would have missed me there, but I had paranoid dreams of him riding past and waking up hours later, after the Eugene control was closed, and having to ride home with a DNF and no breakfast. The descent is what I’ve heard called a “pedal, pedal descent” and is not nearly as fun as coming down from McKenzie Pass. I found it disorienting in the dark and couldn’t always tell if the road was rising or falling. I felt like I was coasting uphill with a tailwind and pedaling downhill. Headlights down the road looked like they were at the top of an impossibly steep climb, but the road turned out to be flat. Maybe I didn’t take a long enough nap at the summit. We were happy to reach Westfir, even though that just means there’s one more steep climb before Oakridge, but at least we’d made it down the Aufderheide. 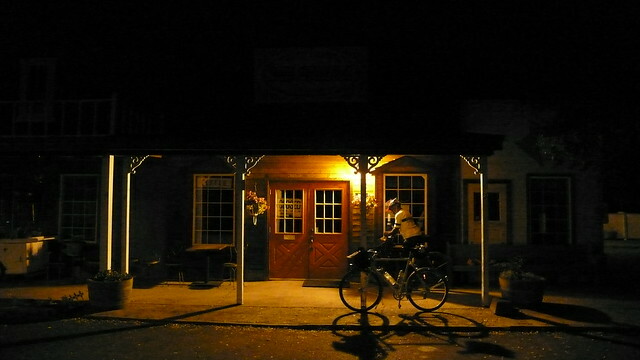 In Oakridge, we ate the last of our food in front of the post office and then searched for an open business on Hwy 58. We didn’t find anything and pulled over in front of St Vinnie’s (!) to put on more layers – it was getting cold and much of the rest of the ride is downhill (not entirely, sorry) – and took an impromptu ditch nap. Vinny had the good sense to lay down, but I fell asleep sitting up and woke up with a stiff back. So it goes. The shoulder on 58 is narrow in places and cars drive faster than they should, so be very cautious. If you’re sleepy and swerving, get off the road and sleep. Remember that it doesn’t matter if you get in under 74hr 59min; safety first. If you’re wicked fast (as in getting to Oakridge when businesses are open), there may be more traffic, so you’ll need to be even more cautious than those of us who reach this point in the ride late at night. Everyone gave us excellent room while passing, but there were mostly professional truckers on the road. Fires earlier in the day left the air through this area thick with smoke and stinky. Signs proclaimed “fire activity ahead,” but the fire must have been out or sleeping, because we didn’t see any activity. Hopefully there won’t be any significant fires for the brevet weekent. Turning off of 58 in the Dexter/Jasper area, the landscape suddenly resembled the beginning of day one, with sleepy cows and horses and a light mist over the road. It was similarly cold, too. We were pedaling slowly and, even with all of my layers on, I was shivering. On the first of two bike path sections, Vinny was mesmerized by the winding path and had trouble with his focus, I drifted ahead and met a young coyote who let me coast to less than 3 feet away before turning to run into the brush. The Middle Fork of the Willamette river rushed along beside us, reflecting moonlight through the trees. In Springfield, you’ll return to city streets briefly before returning to bike paths. I’ll give the cues a careful going over and will provide a little map for riders because, as Eugene-local Michal Young describes it, the path is like a river delta, with little branches going everywhere. You’ll mostly bear left at the forks, but it still gets confusing. Eventually you’ll reach a little red suspension bridge over the river and then it’s just a few turns to the finish. We stopped to wait for a long freight train at just about 6am. Two hours until the control close. Vinny turns to me and says, “The fates are still trying to make us DNF this ride. How long is this train, anyway?” Fortunately, we were towards the end of the train and it was only a few minutes delay. At the hotel, we rang the night bell and the manager was surprised to hear us ask to check in for our Sunday night reservation. We told him we’d come down by bike from Seattle and he offered us a late checkout; we accepted. Finally, we got more than 3 hours of sleep. Protip: there’s a Buffalo Exchange just a few blocks away where we bought some canvas shoes (bike shoes off!) and casual clothes. I even found a nice denim shirt so I could pretend to have some fashion sense. Michal Young rode to the hotel to meet us around 11am and we walked into town for lunch and tall tales. A few hours later, we were sleeping on the Amtrak Cascades train, headed North, headed home. *Vinny’s Garmin was reporting twice what mine was on the third day of our ride, but I suspect Strava corrected for errors as this is close to the RWGPS estimate. Imagine it as 10000m to be safe. You won’t regret overestimating the climbing on this course!